There’s a lot of uncertainty as we head into 2019. The Fed is expected to raise rates another two to four times. We’ve got a slowing housing market thanks to rising rates, rising inventory, and lower overall affordability. We also have constant geopolitical risk that never seems to go away. Before we look at Wall Street’s 2019 forecasts, let’s first look at their 2018 S&P 500 price target forecasts. As of Dec 2, 2019, we’re at 2,760 on the S&P 500 after Fed Chair Powell gave a more measured speech about his interest rate hike plans. Bank of America Merrill Lynch chief U.S. equity strategist Savita Subramanian believes the S&P 500 will climb to 3,000 in 2018 and then drop to 2,900. If Savita’s 2019 forecasts come true, then despite a drop, 2,900 is still 2019 a 5.5% return from current levels. Her 2019 concerns include trade, geopolitics, a widening federal deficit, increased Federal Reserve tightening, increased volatility, and a peak in homebuilders in late 2017, which tends to lead equities by about two years. This two year lag is the most interesting datapoint from her research note. The strategists are forecasting 20% to 25% gains in 2019? 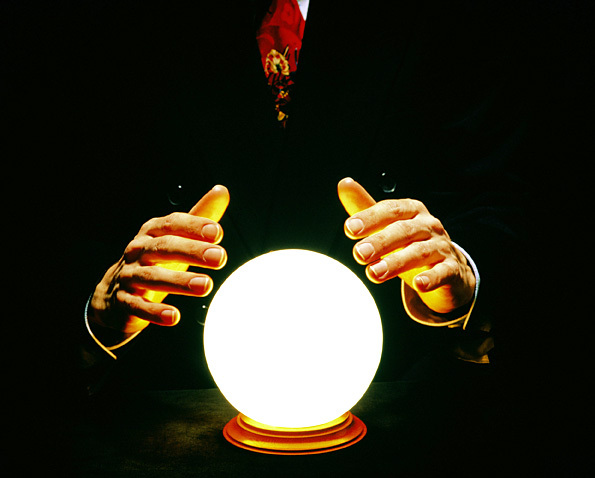 Even the most bearish forecast is a 15% gain from current levels… It must be a great time to buy! For good measure, my “bearish” forecast for the S&P 500 is 2,160 by December 2020, a loss of 10% from current levels. Let’s see who’s right! I am a private equity professional that read quite extensively on the markets. 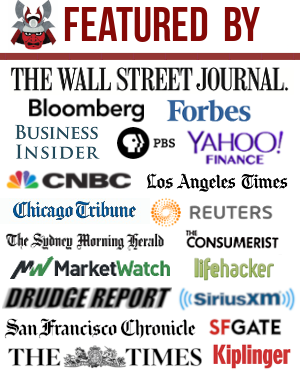 Most of the professional news sources (not WSJ, more like Bridgewater Daily) are suggesting that the next 2-3 years will be turbulent in the stock market. I would urge people to do their own due diligence and not listen to these sell-side analysts – most of them are extrapolating recent out-performance of companies (which has been boosted by trump’s tax reforms) into the next decade. Agreed. It was amazing how many of those sell-side analysts are grossly wrong. Anybody else in other industries with such demonstrated gross incompetence would have been fired long ago. Want to participate in the market, but without the downside? SPY Dec 2020 280 calls can be purchased for $25. You can get a 3% CD now days. So you have 6% (2years at 3%) to put toward these calls. At 275, 6% is $16.50 putting you at a $8.50 (3%) max loss. If ya want (almost) no loss, sell the 325’s for $8. You’ll get most of the upside upto 325 (18-ish%) at the end of two years and it will cost ya .2% or so. There are some minor mis-calculations up there that I realize, intent is to show the way to participate if you are fearful. It can be a long discussion but you can sell a 30- to 45 day expiration, say 16 delta OTM call to reduce the cost base of you 2020 long call, and you don’t need any extra capital to do that. It may cap your upside move but the probability of your OTM short call gets touched is only 16%. You can keep doing that until you decide to take the entire position off. If it were my trade, I would buy a long ITM 2020 call and sell near month OTM call, as I don’t like buying long calls with only extrinsic values that decay away over time if my direction assumption is wrong. It is amazing these sell side analysts can be drastically wrong in their predictions and still can keep their jobs. With your movements in/out of equities during these periods, I’m sure you have factored in the impact of taxes (short/long term gains) on your performance? Just curious how you manage that? While I try to do some of this in my non-taxable (401k/IRA) accounts, I’ve always tried to minimize my taxes and take a much longer term focus on the taxable accounts. I also keep a ‘phantom’ account (not real) that I use to test what would happen if I did this across the board with no regard to taxes. I’ve had good and bad years, but overall it has not done as well as a more conservative buy/hold, selling only for tax loss harvesting. I also believe that if I was doing this for real, performance would be less as I wouldn’t be as willing to take as much ‘real risk’. Mos def. Rollover IRAs don’t have tax consequences when trading until withdrawal. Generally best to hold for 12-month + to pay long-term capital gains tax rate. Really, the most bearish forecast that analysts come up with is slightly up from where the S&P is now? No surprise. Human beings suffer from the delusion of recency bias. You’d think “professionals” would take that bias into consideration. I remember in 2007 analysts predictions had similar upward trajectories. Folks as Buffet says, be fearful when everyone is optimistic. I chose to keep my cash in P2P and interest income fund. I’ll end the year up by just under 7% from those returns. Given the S&P turned negative and is sitting at only 3.2% gain going into year end, happy that I made this decision. I’m estimating 2019 to be a similar year with lots of up and down but ending up close to where it started. Therefore, I’m staying with my 2018 strategy. I will leave a fair amount of cash available to purchase stock if the market drops significantly during 2019. Don’t be scared, embrace the bear, that’s how you make money by buying low remember? And watch copper prices after the summit this weekend! Happy holidays to all you smart investors out there. We are probably looking at the greatest financial collapse in history. It’s all going to burn. Do not use David Lynch as primary your source for financial information. Loved the not so subtle weed joke. Don’t forget most of these guys predictions last year. Remember when they all were talking about a synchronized global recovery? Put your money in emerging markets they said. If they wrote these predictions on toilet paper at least they would be good for something. I don’t have anything against predictions. There fun to make, especially when your right, but it has been shown that throwing darts is as accurate as your average professional money manager for any time period under 4 years. What return do you need over the next decade? Invest accordingly. If you need 4% do t take 10% risk. Your only advantage over the pro’s is a longer term time frame. Otherwise you’ll be beat every year. Don’t chase short term returns. People have more time and more money than you to achieve that goal. You’ll lose. Great – where can I get 4% guaranteed? Savings bonds held for 20 years regardless of the rate. They are guaranteed to double. That’s right; Hussman’s price target for the S&P 500 is 960. At least he actually has skin in the game, although his funds’ performance doesn’t look too good. Just wanted to make the point that forecasting without “skin in the game” is nonsensical. But… skin in the game is not a sufficient condition for accurate forecasts. Very cool. Does this means he’s getting blown out of the water? What are his performance numbers on a 1 year, 3 year, 5 year, 10 year etc basis? I guess so long as he’s losing his clients money, and not his own, he’ll be fine? $400k base… Wow! Is that just for the top banks or boutique/regional/middle market ones as well? Thanks for all your posts. Huge fan. Pretty standard for the larger banks. But probably less than 1% of the workforce get there. This post is so fascinating! Thanks for putting all those forecasts together. If the markets are flat to slightly up next year I will be happy. I’ve been feeling like we are walking off a cliff for a while and have been fearful next year will be only downwards gloom and doom. I’ve been putting more cash into the markets recently so these forecasts make me feel better about my decision to keep legging in little by little during dips here and there. Here’s hoping we end the year strong and things go well next year! Keeping this in mind do you think I should pull back on my contributions to my 401k that allocated mostly to equities? Right now I am maxing it out. If I allocated less to my 401k I would probably put that money towards my Fundrise account. Donno your age, net worth, financial goals, etc. In general, I would always max out your 401k no matter what. It’s your after-tax investments where you should probably think more thoroughly. Think the S&P will be at a round 3000 with 50% probability… well, shoot, I think the Saints have a good shot at the Super Bowl. A point well taken — to me, none of the differences among “predictions” appear statistically significant. Good analysis and a good question — in a parlor game format my best unprofessional and probably unreliable guess is 2870 – 2910 at the end of 2018. My initial, unprofessional and probably unreliable but not definite guess is 3050 give or take 50 points sometime during 2019. Do not rely on my very subjective and most likely flawed estimates. 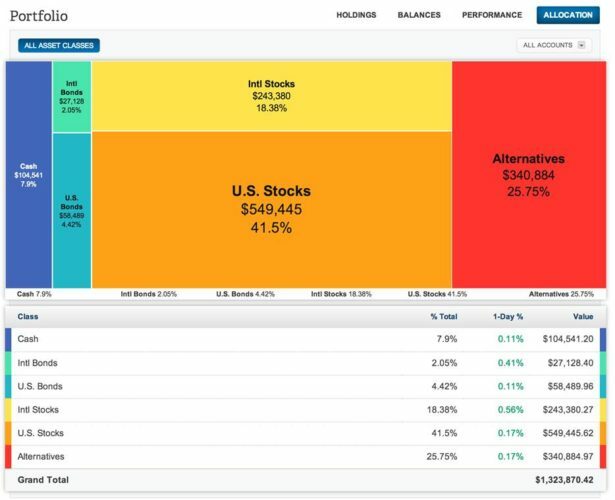 Only 20% of my assets are in stocks, and I consider a 2019 5% annual yield acceptable. I think we similarly see mid-2800s with an early retreat in 2019 and a bumpy overall outlook. I’d say around 2800; the boost contributing to holiday shopping and traveling, then pulling back in January. I have a target of 400 for the S&P. You’ll have to let us know what kind of end-of-year bonus you get. Good luck with your shorts! It’s always great to put your money where your mouth is. They might revisit those multiple as well if interest rate start being stable in 2019. I am not sure how many rates hikes analysts assumed in your table above to get those 2019 P/E multiple. 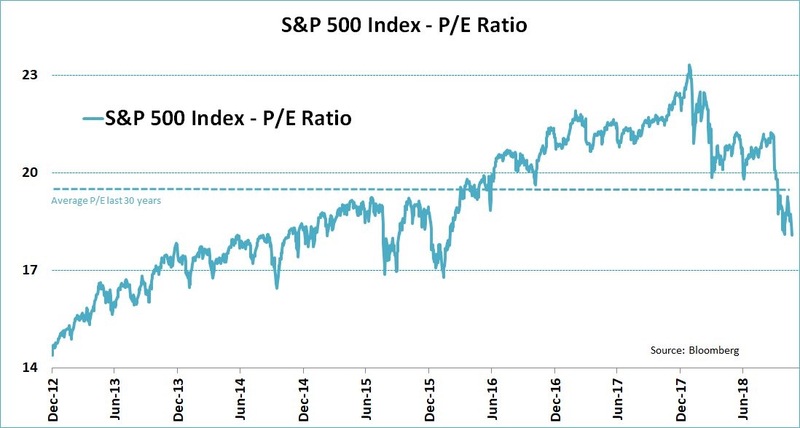 Maybe with no more hikes in 2019, they will up their P/E ratio multiple target? Sam, Do you ever consider writing about individual stocks? I would be curious to see your thoughts on individual FANG stocks in this climate? Seriously The Who f*cking knows question on the century. Either going to stay intact with cloud revenue allowing it to dominate everything without gov intervention then it splits making you a fortune as each of the pieces dominate. Or it gets killed before it takes over the world and crashes. Not in posts. I don’t want people who aren’t in my financial situation to follow every move I make. It’s dangerous and inappropriate IMO. Further, I’m not writing about every trade I made. But, I have been writing about how I’ve been accumulating stocks in my private newsletter. I just published one today saying what I plan to do once the S&P 500 hits 2,850, if it gets there this year. Then there’s the FS Forum, where it’s fun to talk individual stocks. Who Else Is Buying In This Tech Wreck? – I write about everything I bought in November. I agree with Tobias’ notion about investor expectations being sufficiently reset lower. 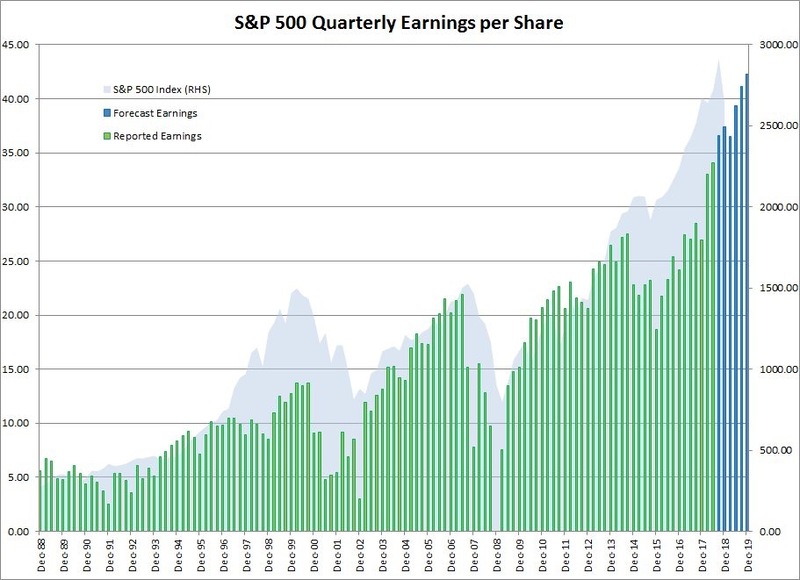 This gives more bias to an upside surprise as companies announce earnings results in 2019. 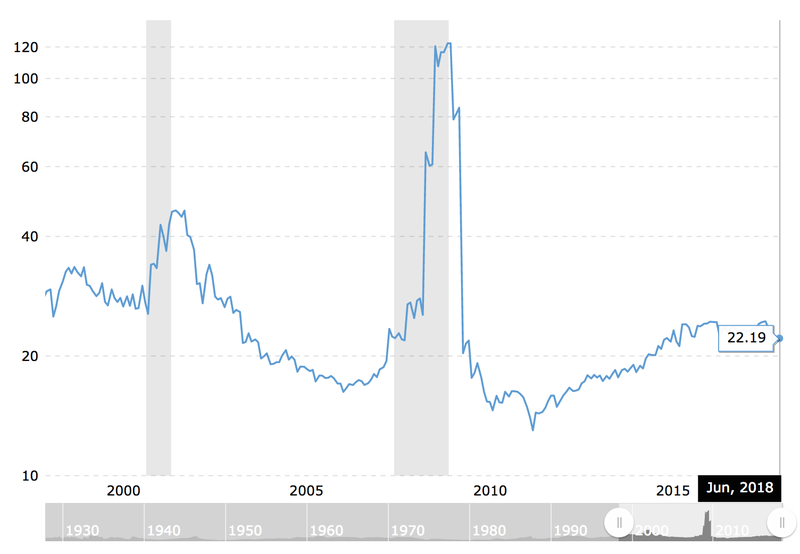 Regardless, I’m transitioning out of stocks in the coming quarter or so as the market likely moves higher in response to Jerome Powell’s statements yesterday because we’re trying to have more stability in our funds for a house down payment in the next 2-3 years. Because investment forecasting should be viewed through the lens of probabilities associated with ranges of outcomes, I think this recent market pullback provides an opportunity to invest in beaten down stocks unfairly thrown out of favor. I think that could mean tech will likely regain some of its momentum seen during this bull market. Time will tell, but I foresee a market rise into year end 2018 and modest growth throughout 2019. Labor market figures and inflation will tell the story in my mind. The valuation doesn’t look too bad now. We’ll just stick to our asset allocation and add what we can. I’m not hopeful for 2018 and 2019. It’s been so volatile lately. I’ll be happy if our net worth increases 5% next year. Time to hunker down and avoid spending money. Alloccate at least 10% to physical gold. Deutche bank don’t look good after today’s police raid regarding money laundering. 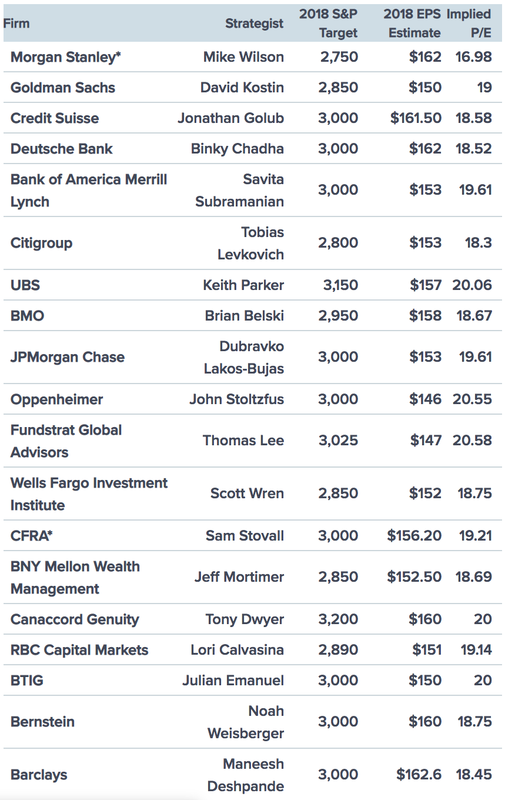 Interesting summary of some of the major wall Street gurus. Again have to take everything with a grain of salt as no one really knows how the market behaves otherwise they would go all in with their own money and become instant billionaires. I actually have this question to pose to you Sam and I have been debating it myself. I am looking to come into some substantial money at the end of the year with the sale of one of my most profitable investments to date (about 85k invested 10 yrs ago will look to have a 7 figure return (and pretty much already have all that initial capital returned in the form of distributions). As such I was thinking about front loading my daughter’s 529 plan with the max 5 year contribution or should I continue what I had been doing and only do the annual contributions (she is in 8th grade, so have essentially 4.5 years left till college starts). I am looking to redeploy this money in other investments as well because I know this cash will feel like its burning a hole in my pocket and I want to invest it (my plan is to put majority of it in real estate syndications) with the balance in the market. .
Here’s my unsolicited advice. Front load the 529 ad get that out of the way. Make sure the investment is I something reasonably conservative depending upon what you’re looking to spend. I’ve got my kids college pre-paid and the house is paid and it’s a HUGE peace of mind component. Granted may not be the best mathematical return. But if your kid has to go to university of X instead of Yale they’ll be just fine….the financial “devastation” you think is a big deal at the time will become a “wow, things turned out just fine” situation at the end. So having it pre-funded is all upside even if mathematically doesn’t work out. Take the rest and go conservative. There are some good CDs right now at 4% and you can make a nice return plus’s your income that can make up any difference you need (plus your job) later when the kid hits college. I’m currently riding my equity position 90% not growing, building cash 10% and growing and have college paid for the kids (state U guaranteed) and feel pretty good. It is funny. I have preached against market timing because no one knows where the market is headed but I guess in the back of my mind my hesitation to drop 5 years of contribution (which would have to be in 2019 since I already did max this year)probably is influenced by market timing subconsciously (I don’t want to drop 5 yrs of money at the potential top of a market to see it go down when I could do a contribution annually and have it dollar cost average instead). Your points make sense. Thanks! Please do tell what this 11X return investment is! I personally love cash for 2019 and beyond. Money market rates are at 2.5%+ as are 1-year UST bonds. AAA munibonds are higher for longer-term durations. I would go $15K/year. Since you have $1M+ return from just this one investment alone, whatever you do doesn’t really matter. It was actually an investment in my medical office practice building. Got in on the ground floor when we built and moved to this new location. Cash distributions yearly for over 10 years have already more than paid for my initial investment. But yeah very lucky because I did not really understand investing or anything to do with finance back then. Just thought it would be smart to put money into a building and pay rent to myself as well as take advantage of the local economy which has been absolutely booming. Good time to sell too as I think continued rising interest rates etc will cause some impact in CAP in future. I believe the S&P finishes at 3,515 with earnings at $190.